The Chicago Bulls’ Derrick Rose drives to the hoop in the second half against the Cleveland Cavaliers at the United Center in Chicago on Feb. 12. Back in March 2011, I wrote a column for The New York Times about how, statistically speaking, Derrick Rose didn’t deserve to win the NBA’s MVP award over Chris Paul (and others). That’s why it was so disheartening to see Rose suffer yet another devastating injury Tuesday night, this time a torn meniscus in the same knee that he injured early in the 2013-14 season. While the severity is still unknown, as is the course of action that Rose’s doctors will pursue, this latest setback could be Rose’s fourth season-ending injury in as many seasons. It’s a string of bad breaks that shouldn’t befall any athlete, much less one who ranked among his sport’s most exciting before injuries struck. The bigger question concerns whether Rose can overcome another misfortune to contribute meaningfully in the future. And in that regard, he’s in uncharted territory by the standards of NBA history. Through age 233 (for Rose, the 2011-12 season), the Bulls guard had generated 26.1 wins above replacement (WAR), a total that ranks 32nd among all NBA players since the 1977 ABA-NBA merger. For comparison’s sake, LeBron James is the 23-and-under leader over that span, with 82.2 WAR. But plenty of great players — from Adrian Dantley to Shawn Kemp and Shareef Abdur-Rahim — also had fewer WAR than Rose through the same age. Based on his average yearly performance through age 23,4 it would have been fair to expect about 26 more WAR from Rose between the ages of 24 and 26.5 However, Rose produced just 0.9 WAR between his lost 2012-13 and the current 2014-15 season. Through no fault of Rose’s own, that 25 WAR shortfall was the largest of any player in the sample I examined, a tangible measure of just how much was lost over the past three years. 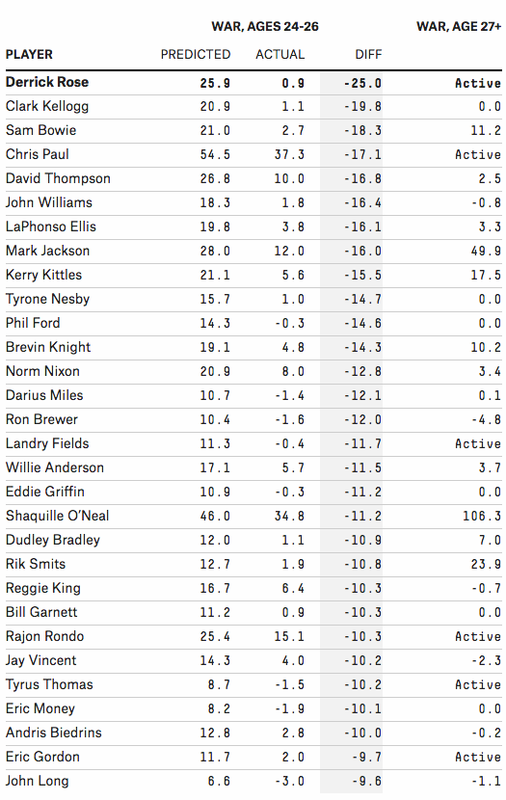 And Rose’s peers at the top of the shortfall list show what uncharted comeback territory he’s in. Big man Sam Bowie, now known mostly for being drafted one pick ahead of Michael Jordan, returned to post 11.2 WAR after missing his entire age-26 season with a stress fracture but wasn’t anywhere near as effective as he’d been in his first two seasons. And Bowie is the success story of the group. Clark Kellogg undershot his projected age 24-26 WAR by 19.8, retiring four games into his age-25 season after a trio of knee surgeries. David Thompson’s issues with injuries and substance abuse caused him to undershoot his expected age 24-26 WAR by 16.8 and then generate only 2.5 WAR from age 27 onward. John “Hot Plate” Williams succumbed to injuries and struggled to control his weight, producing -0.8 WAR after age 26. And LaPhonso Ellis was never the same player following a knee injury suffered early in his age-24 season. Most of these cautionary tales are at most only tangentially similar to Rose’s injury travails, but they do underscore just how rare it is for a player to return to productivity after a spell of lost prime seasons, even if — like Rose — they’d shown tremendous promise as young players. I even had a framed photograph of him on the wall of my old office at Sports Reference. He ranked 20th overall during his best season, 2011-12. For all ages in this post, I’m referring to Basketball-Reference.com’s convention of listing a player’s age on Feb. 1 of the season in question. Using a historical regression between average age-adjusted WAR per year through age 23 and total WAR between the ages of 24 and 26.